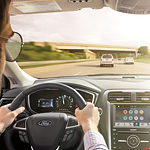 Technology Features of the Ford Fusion that Increase its Efficiency | Fiesta Ford Inc. Through regenerative braking, the Ford Fusion recovers around 94% of kinetic energy that is normally lost during braking in a conventional vehicle. This recovered energy is returned to the battery where its stored for future use. Smartgauge with EcoGuide encourages you to drive more efficiently by displaying leaves as your vehicle efficiency improves. You can become a better driver this way while making your car's fuel last longer. We find the Ford Fusion a top choice in midsize sedans for using technology features to improve efficiency. You'll also feel happy knowing that almost all of the energy normally lost from braking goes back to the battery.